Kevin Harvick (4) leads the way in the AAA 400 at Dover International Speedway on Sept. 4, 2015 (photo courtesy of Getty Images for NASCAR). Kevin Harvick’s chances of advancing in the Chase for the Sprint Cup were long heading into Sunday’s elimination race, the AAA 400 at Dover (Del.) International Speedway, needing to win to keep alive his chances at repeating as Sprint Cup champion. He did what he needed to, though, claiming his first-career win at Dover across all NASCAR national touring series. And he did so in dominating fashion, leading 355 of the 400 laps that made up the race. 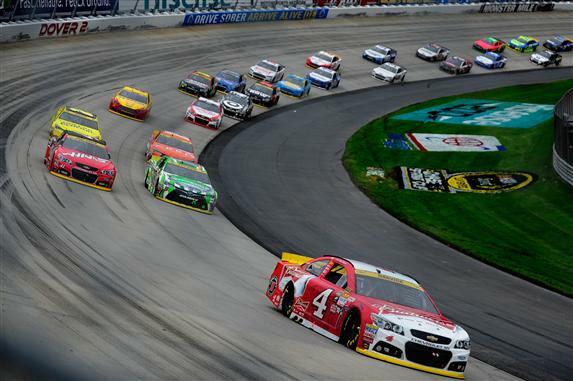 Harvick took the lead for the first time on lap 24 and led most of the remainder of the race. Kyle Busch finished second, and Dale Earnhardt Jr. recovered from nearly going a lap down to finish third. Jamie McMurray was fourth, and non-Chase driver Aric Almirola played Chase spoiler by rounding out the top-five. Busch headed into Dover outside the top-12, but his runner-up finish moved him up into position to advance. Earnhardt was 12th in points — the Chase bubble — before the race. At the checkered flag, he was tied with McMurray for the final transfer spot. Earnhardt got the spot by tie-breaker, decided by the highest race finish in the first round of the Chase. The highest finish between the two drivers was Earnhardt’s finish Sunday. The other drivers failing to make the second round of the Chase were Jimmie Johnson, Clint Bowyer and Paul Menard. Johnson suffered a broken axle on lap 103 and spent significant time in the garage. Bowyer was forced into an unscheduled pit stop for a loose wheel in the first half of the race. Once Harvick took the early lead, only the pit strategy of others took him out of the top spot in the running order. Between yellow flags, he routinely built up leads of over five seconds. Denny Hamlin beat him off pit road on lap 40, but incurred the first of two pit-road speeding penalties. The first of those penalties handed the race lead back over to Harvick. He wound up third on a restart following a caution on lap 231 after Busch and Martin Truex Jr. took only two tires. On lap 248, though, Harvick retook the lead. Kenseth stayed out during a caution with 43 laps to go, while Harvick pitted for two tires. When the race restarted, Harvick blew by Kenseth and retook the lead. An eighth and final caution came on lap 371. The front-runners stayed out, and when the race restarted, Busch got by Kyle Larson to take second and set his sights on Harvick and the lead. Busch had taken four tires to Harvick’s two during the previous caution, but that still wasn’t enough to catch Harvick for the win. Finishing sixth through 10th were Kasey Kahne, Kenseth, Ricky Stenhouse Jr., Larson and Joey Logano.